2.Tarmac texture preparation. 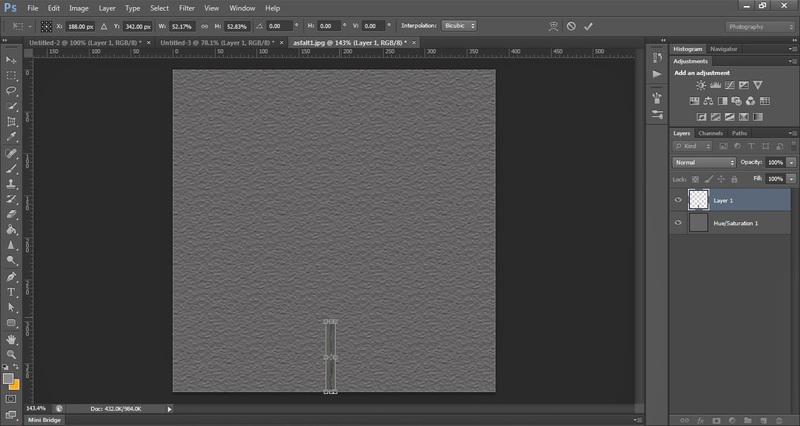 Perspective Crop Tool (C). 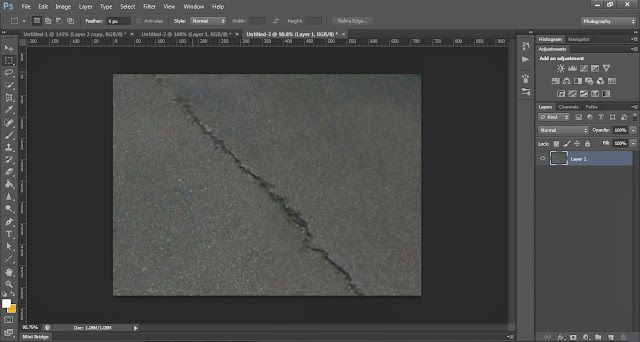 After you have created your plain texture of asphalt you can start creating white lines, yellow lines, side walks, holes cracks in the road etc. But before that we will have to think of a scale that everything will match to. I will explain that to you all on example of 'Rally of Magnolia'. To have everything matching to scale you need to recalculate meters for pixels. For example in RM (Rally of Magnolia) we have 4x4 meters in 256x256 pixels square. 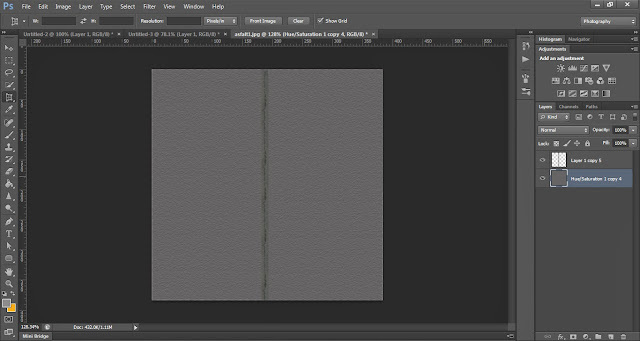 Believe me, it is easier to do textures when you have that scale to refer to. fps (Frames Per Second) . 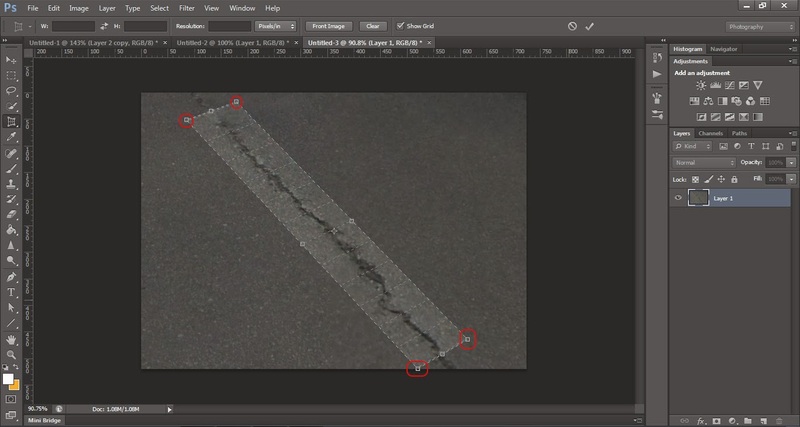 Let's create our crack that goes trough the middle of the road. In this example our road will be 6m wide. So create document 384x384 pixels. Move top corners to the place where top of your texture is going to be and the bottom to low end of your texture. This is what you should end up with. Then copy and paste it on to your plain tarmac texture, and by pressing Ctrl+T thats free transform, click and grab top right corner. 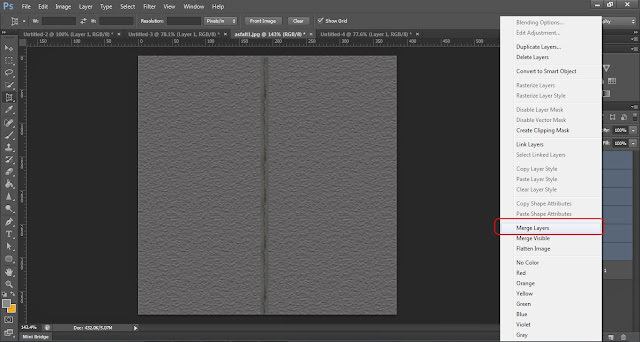 By holding Shift you can change size of the texture without messing wit it shape. 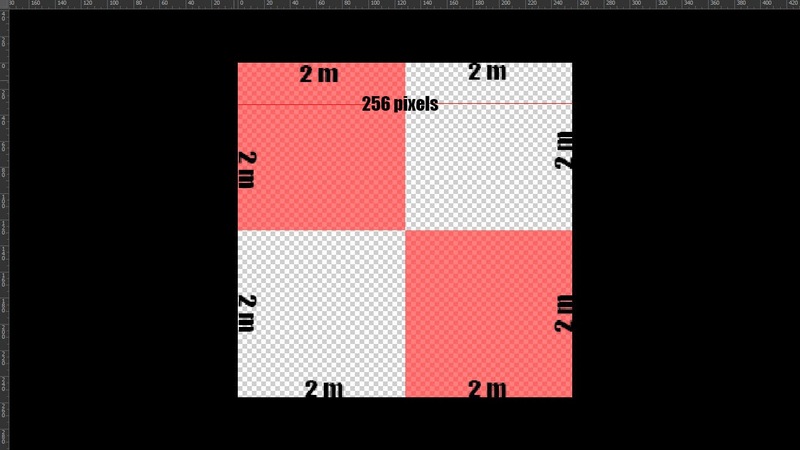 Next choose Move Tool (V) and by holding ALT move that image. That way you will duplicate that layer. 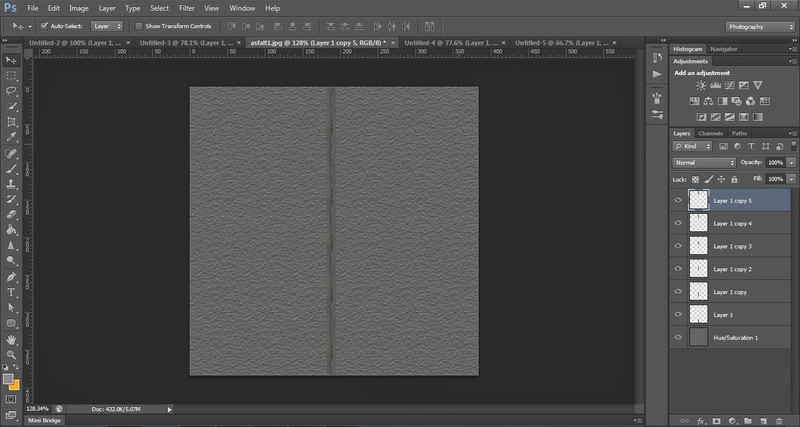 Repeat this few times until you get crack trough whole of your texture. You should have couple of layers. Marge Layers to get only one layer of them. You should end up with only two layers. Your Crack Layer and your Asphalt Layer. 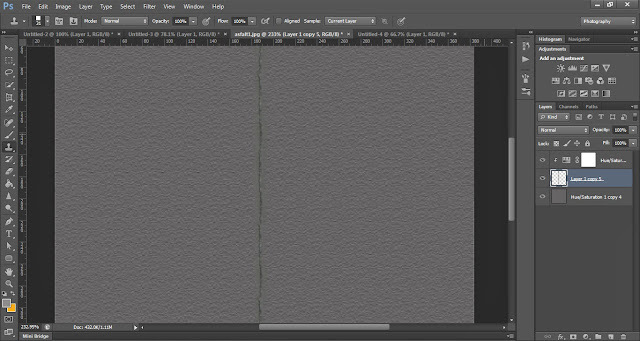 At this time it is good to start naming your layers by double click on it. 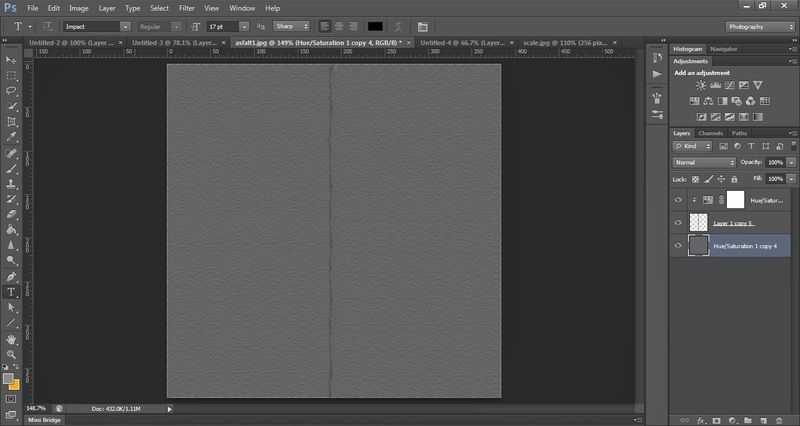 Believe me, it will shorten your work later on. This will be much easier to process. Then erase the sharp edges with Erase Tool (E) with hardness of the brush set up to around 30-35% so it blends in with tarmac. 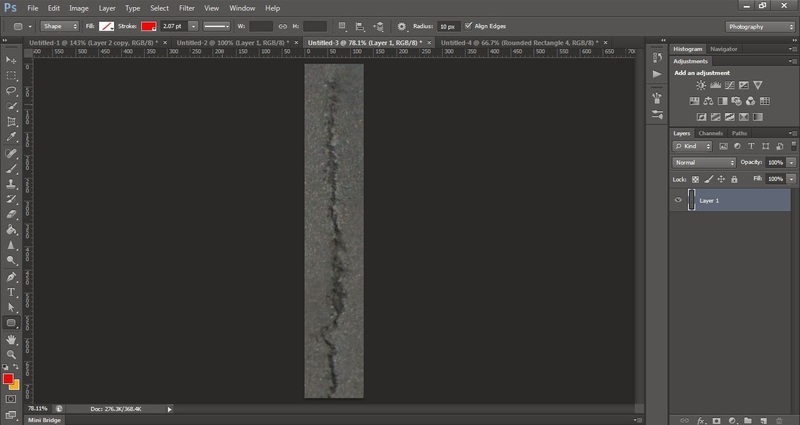 You can adjust color, brightness or contract to match color of tarmac layer and there you have your street with basic crack in the middle. If you have any questions send me email I'll be more than happy to help.